The story opens with some thugs planting a bomb at a fancy dinner party, and disguising themselves as waiters. In the main hall, Bruce Wayne is discussing his bid for intelligence gathering with General Turgidson. Lex Luthor joins them, to discuss his (more violent) competing bid of combat robots. Lex manages to insult Bruce before he moves on. Moments later, Clark Kent joins the conversation. Bruce and Clark admit to having met before, under “very different circumstances.” As the conversation continues, both Bruce and Clark detect the presence of the bomb. They make their excuses, and disappear. Superman grabs the bomb and carries it into space. Batman goes after the escaping thugs. Supes returns and helps capture the crooks. Suddenly, a small earthquake strikes Gotham. Later, Commissioner Gordon is playing a video of demands made by Maxie Zeus. If the insane criminal’s demands are not met, he’ll unleash a full earthquake on the city. Bats and Supes listen in, and then go off in search of a device capable of creating such earthquakes. They find nothing. Meanwhile, Lex unveils his new hunter-seeker robots, capable of finding Maxie Zeus and stopping the threat. Across town, Batman and Superman find some of Maxie’s goons, and that leads them to Maxie’s hideout. They grab Maxie’s scepter, which controls the bomb that could set off an earthquake. Moments later, Luthor’s robots burst in, guns blazing. Maxie and his gang are foiled, and the military is suitably impressed with Luthor’s robots. Batman has figured out the connection between Maxie and Luthor, and confronts him. Batman reveals his evidence, and blackmails Luthor into withdrawing his military contract bid. Luthor agrees. In the end, Superman and Batman discuss their different approaches, but agree they both get the job done. As this issue was written before the Superman animated Series, Puckett did his best to fit Superman into Batman’s animated world. I try my best to read this story without the knowledge of what would come later. The story still comes across as a fair, but not great, attempt. It has all the hallmarks of editorial dictating the characters and scenario, and the writer stringing everything together as best he can. My biggest question, though, is if the thugs plant the bomb on page one, why are they disguising themselves as waiters and hanging around. The bomb is on a timer. Shouldn’t they get as far away as possible? Oy! 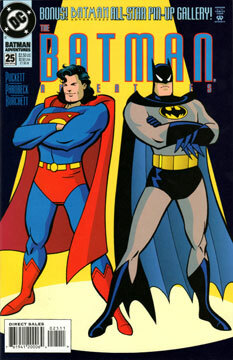 This issue was created well before Superman: The Animate Series was underway, so it took its visual cues for Superman and Lex from the current comics of the time. And that means hair-fest! Supes has his awful mullet, and Lex looks like a reject from a Bugs Bunny cartoon set in Scotland. These awful designs are not Parobeck’s fault (his art is stunning, as always). He was just following orders, I’m sure. But I really can’t get past those awful character designs. Oh yeah. Due to the fact this came out before Superman: The Animated Series, there’s just no way this one works in continuity. Only if you like mullets and red beards without mustaches.